I've just realised that the left hand side of this has been trimmed so bare that in mind. So I got asked to share and this is the revised (but still awp) version of the first snow layout. I reduced the clear frosted snowflakes and made a cluster (as suggested) to "draw the eye across the page" LOL - that's just something I've read in a scrapping mag. I reduced the red felt in the bottom left so it doesn't go to the border (as suggested) and added the white stiching. I made and added my foil stars using Atomic Cupcake's new foil action (www.atomiccupcake.com). Because I can get too "boxy" at times, I did uneven journalling strips and attached them with a little red felt brad I made from that red felt mat. I still sort of want to put something in the bottom left hand corner of that piccie of my son on the left hand side. I tried putting the snow flakes down there but it didn't work. I am going to finish the journalling and then not look at it for a week, and if I am happy then it stays. Something I am coming to realise is that the layout will never be perfect, you could always change something and it would not necessarily be better, just different. So I am not obsessing about these, but focussing on getting as caught up as I can whilst I have some time. For lvmommy - what do I do for a living that I work with a computer, fly on planes and think maths is cool LOL. I work as a consultant. I am blessed to work from home it means I can drop my kids off to the class room and pick them up from the classroom. My postgrad degrees are in HR and Demography. I do statistical modelling and design system simulations and decision support systems, this is what my PhD is in. Are your eyes rolling yet LOL. It is so boring to anyone else. The flying on planes is because a lot of the work I do is for clients who are all over the country so I will fly in fly out for a meeting or a couple of days for briefs, presentations and the like. Its funny when I was a child my father would be away every other week with work, and I thought it was just so glamorous and exciting to travel on planes and stay in hotels. And then you do it as a grown up and you realise it is tiring and boring and staying in hotels is awful. Even if you catch up with friends for dinner, you still go back to an empty hotel room at some stage and that is just not fun compared to home. Its one of the reasons I loved making the switch to digi scrapping, now when I go away overnight I take my little external drive with me and sit in my hotel scrapping on my laptop. I don't miss home quite so much. Bet you're sorry you asked LOL. And on that note its getting late so I am off to bed. rotf laughing at you! i actually think demographics and stats are interesting, but i've been told i'm a bit of a geek at times, lol! some of my favorite under-grad classes were math for elementary school teachers (3 semesters). it was great to learn that there were different ways to get to the same answer and that not everyone understood the same explanation. the best part was realizing i had a gift for translating what the teacher was lecturing on into a variety of examples that the rest of the class could understand. i think that's what i love about statistics: with skill, you can make them look better or worse and work for you, not against you. you just have to know how to translate them. hey! now you're rolling your eyes at me! i saw that, lol! oh yeah, i think you might be happier if you try to put a snowflake at the bottom *right* of that photo. 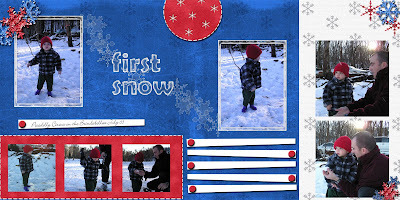 it will feel more balanced and parallel your line of snowflakes across the page. also, try putting the stitches *on* the red felt instead of around. it will echo the stitching on the red circle and add a layer of texture on top of the felt. just some suggestions; no need to use them, just try them out for grins.